W I N T E R 2 0 1 4 | The LandReport 75 LANDREPORT.COM N owadays, the network of roads on the Waggoner is vastly improved, but the distances still stretch the imagination. From the ranch's southwestern corner, at Davis Camp, a crow will fly nearly 50 miles to reach the northeastern boundary, at Whiteface. The massive holding dates back to the mid-1800s, when a 26-year-old widower named Dan Waggoner moved his family to the Catlett Creek area of Wise County. Despite the constant threat of Comanche raids, Waggoner was able to expand his small herd of longhorns. By the late 1860s, thousands of cattle bearing the D-71 brand were being trailed to market in Kansas by seasoned hands, including Dan's teenage son, W.T. By 1870, father and son were partners. 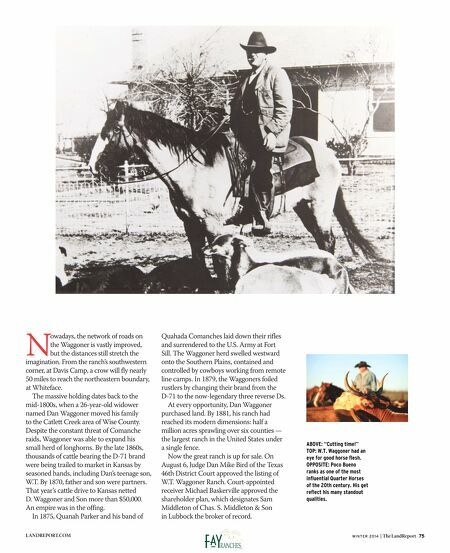 That year's cattle drive to Kansas netted D. Waggoner and Son more than $50,000. An empire was in the offing. In 1875, Quanah Parker and his band of Quahada Comanches laid down their rifles and surrendered to the U.S. Army at Fort Sill. The Waggoner herd swelled westward onto the Southern Plains, contained and controlled by cowboys working from remote line camps. In 1879, the Waggoners foiled rustlers by changing their brand from the D-71 to the now-legendary three reverse Ds. At every opportunity, Dan Waggoner purchased land. By 1881, his ranch had reached its modern dimensions: half a million acres sprawling over six counties — the largest ranch in the United States under a single fence. Now the great ranch is up for sale. On August 6, Judge Dan Mike Bird of the Texas 46th District Court approved the listing of W.T. Waggoner Ranch. Court-appointed receiver Michael Baskerville approved the shareholder plan, which designates Sam Middleton of Chas. S. Middleton & Son in Lubbock the broker of record. ABOVE: "Cutting time!" TOP: W.T. Waggoner had an eye for good horse flesh. 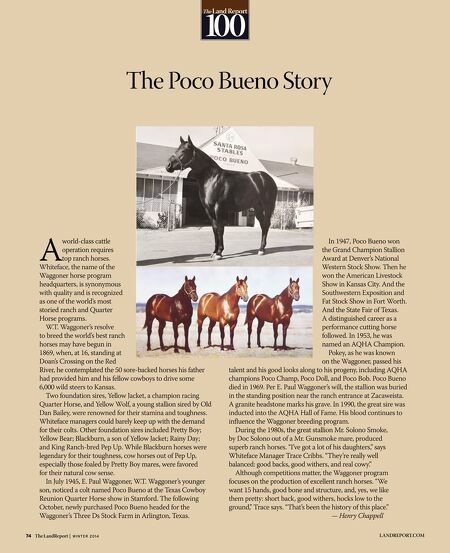 OPPOSITE: Poco Bueno ranks as one of the most influential Quarter Horses of the 20th century. His get reflect his many standout qualities.